With elegant looks, the Fusion Freestanding acrylic tub and faucet combo transforms your bathroom into a personal spa. Relax comfortably with the classic slipper design in a durable acrylic tub constructed. The bathtub includes waste and overflow and holds up to 52 Gal. of water for a spa like experience. The modern freestanding faucet gives the finishing touch of this combo set. This elegant bathtub has solid surface construction, symmetrical backrests, and a freestanding installation. The arching curves are reminiscent of a swan in flight, lending this contemporary design the enduring beauty of motion frozen in time. Easy to clean and cUPC certified - no need to sacrifice everyday practicality for stunning decor. Faucet not included. Fusion 4.9 ft. Acrylic Flat-bottom Bathtub in White and Freestanding Faucet in Satin Nickel With elegant looks, the Fusion Freestanding acrylic tub and faucet combo transforms your bathroom into a personal spa. Relax comfortably with the classic slipper design in a durable acrylic tub constructed. The bathtub includes waste and overflow and holds up to 52 Gal. of water for a spa like experience. The modern freestanding faucet gives the finishing touch of this combo set. 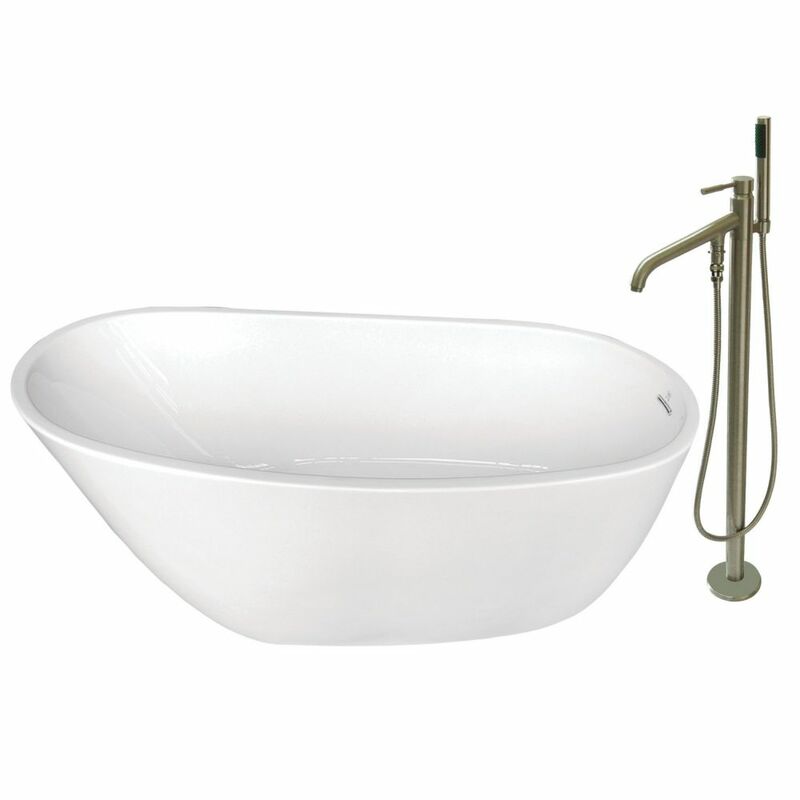 Fusion 4.9 ft. Acrylic Flat-bottom Bathtub in White and Freestanding Faucet in Satin Nickel is rated 5.0 out of 5 by 1. Rated 5 out of 5 by Homer from Have not completed the Bathroom remodel with the tub installed,... Have not completed the Bathroom remodel with the tub installed, but out of the box it is everything expected and more. My wife is very pleased.